In 1864, St. Albans was a quiet village on Lake Champlain in upstate Vermont, just 15 miles from the Canadian border. Far from the bloody battlefields and devastation, life in St. Albans had changed little since the start of the war. On October 10, 1864, three young men checked into a local hotel. The spokesman signed the register as Bennett Young and explained that they had come from St. John's, Canada, for a sporting vacation. Every day or so two or three more men would arrive until there was a total of 21. All were young, averaging age 23, and friendly. The friendliness ended, however, just before 3:00 P.M. on October 19, when groups of the visitors simultaneously entered the town's three banks, announced that they were Confederate soldiers, and robbed the banks of $208,000. While the banks were being robbed, eight or nine of the young men, with guns drawn, were herding the townspeople onto the town common and stealing their horses. Young ordered the men to set the town on fire. They had brought along four-ounce bottles of "Greek Fire," a chemical that would burst into flame when exposed to air, but when they smashed their bottles against the buildings, the stuff would not burn. Among the few townsmen who tried to fight back, one was killed and one wounded. The raiders jumped on their stolen horses, headed north, and crossed with their loot into Canada, where they were arrested by the Canadian authorities. The Canadian court denied the U.S. government's request for extradition, declaring that the raiders were soldiers under military orders, and let them go. It turned out that all of the raiders were Confederate soldiers who had been captured by Union forces and then escaped into Canada. 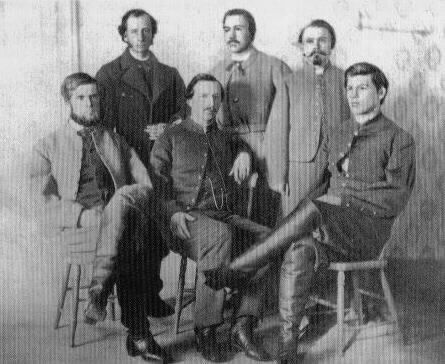 Their goals in the raid, which was authorized by the Confederate government, were to gather cash for the Confederate treasury and to divert federal troops away from the Confederate armies in order to protect their Northern border. The Canadian government did return to the Vermont banks $88,000 that was found on the raiders.